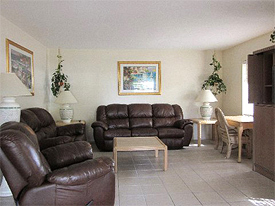 Furnished apartments for rent in Florida are the solution to many vacation problems. Travel broadens the mind, or so they say, but when you have a family, it becomes expensive, especially once the children enter their teens. Vacation time means cramming everyone into a small hotel room, privacy is non existent and tempers can be extremely short. Renting a furnished apartment solves the problem, as long as it’s the right apartment! Multiple rooms will allow you the privacy you need, and you can manage your food budget by cooking simple meals yourself. So, what should you look for in a vacation rental apartment? Affordability is top of most lists when choosing furnished apartments for rent. The cost of multiple hotel rooms can be prohibitive, and of course there’s not just the room to consider, there’s also the cost of meals. The cost of just the daily breakfasts for four in a hotel can easily be higher than your family food budget for a week. So it’s not just the rental cost you need to consider. As long as your rental is conveniently situated for restaurants and takeaways when you want them, self-catering furnished apartments give you convenience as well as the ability to manage your vacation budget, as long as they are well located. Most parents organise their vacations around their children, but as those children get older, isn’t it only fair to take into account what you want to do? It’s rare to find a whole family who love to fish, and for many, solitude is one of fishing’s great attractions. So how can you combine your fishing trip with their vacation? All you need is the right location, and Central Florida is ideal. The St John’s river is famous for its bass fishing, while the Orlando theme parks and the Kennedy Space Center are world class. Add to that the history of St Augustine, the thrill of Daytona Beach and the charm of local shopping and restaurants in towns like DeLand, and you have something for everyone, every day of your vacation. The ideal furnished apartment should have plenty of space for your family. Separate rooms are important so everyone can have some privacy, though children who don’t normally share a room might enjoy being together just for the vacation. Be sure to check the size of the rooms. Some vacation apartments have bedrooms the size of closets! If you’re planning to cook simple meals, be sure to check the equipment available with your furnished apartment. For some, ‘cooking facilities’ mean a microwave is provided. This may be okay for heating up yesterday’s pizza, but if you love to whip up a batch of pancakes for your vacation breakfasts you’ll need a little more. A full kitchen is ideal. So, where can you find furnished apartments for rent with all these great characteristics? At the Tropical Resort and Marina! Our Central Florida location is ideal for every member of your family, and you’ll find our one, two or three bedroom apartments extremely affordable, as well as spacious. You can bring the whole family, and still enjoy your privacy. The restaurants of DeLand are there when you need them, and a full kitchen is at your disposal when you don’t. And if you enjoy fishing, the reputation of the St John’s river speaks for itself. We have expert fishermen on hand to make sure you get all the help you need. Ready to look for furnished apartments for rent?